Rose Reilly Leonard is a local professional watercolor artist whose studio is located off of Princeton Avenue in Brick NJ, overlooking the scenic Metedeconk River. The studio is located on the border of Monmouth and Ocean Counties, on the beautiful Jersey shore. She has 30 years of professional experience in teaching fine art. 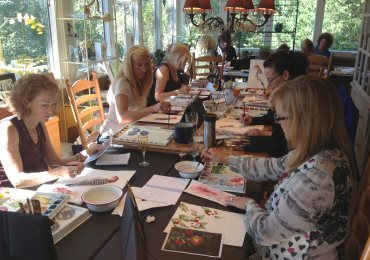 All classes are offered in small groups to allow for individual attention, step by step instruction, and frequent demonstrations for all watercolor techniques. Please see the current schedule to join an existing on-going class, or schedule your own group or class at your venue. Or contact Rose to arrange for private lessons in your home. Now offering watercolor painting parties - for children or adults - held in your home or facility. See our party page for more information. And remember, no experience is necessary.... just desire! - Step by step technical instruction. - Age appropriate curriculum in a relaxed atmosphere, ensuring that students will develop proper technique and enjoy lessons. - Conveniently scheduled two hour class sessions provide substantial time for individualized instruction. - Small class size guarantees individual attention, moving at a pace according to students personal abilities and skills. This enables them to be given the artistic tools they will need to continue art for the rest of their lives. - Students are amazed at the work they produce and are excited to exhibit at our annual student art show. - Understanding Color and its ability to blend and compliment, and how to emphasize with contrasts. - Work with various watercolor techniques including wet on wet and dry brushing; on varied surfaces, such as cold press, hot press, illustration board, masa paper, and yupo - and achieve incredible effects. *The Catharine Lorillard Wolfe Art Club is a national organization whose aim is to promote and advance the work of professional women artists. 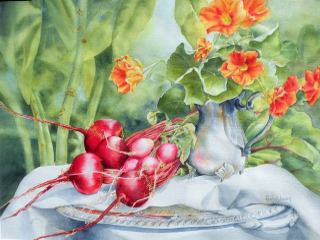 Rose Reilly Leonard is a member of the New Jersey Watercolor Society, the Monmouth County Guild of Creative Art, the Manasquan River Artists Group, and the Northern Regional Cultural Council. She continues to develop and share her lifelong appreciation of the arts. 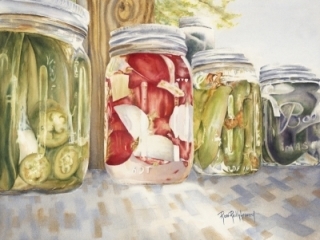 Rose has studied painting and other art mediums for more than 40 years, specializing in watercolor. She is a dedicated teacher and has more than 30 years of teaching experience.